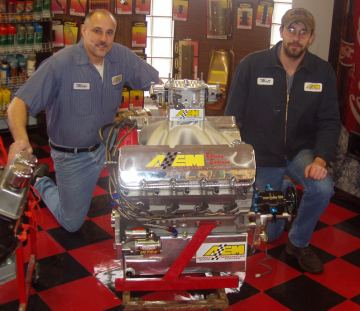 Advanced Racing Engines was started by Donnie Brown in the small town of New Cambria, Kansas under the name Brown Automotive. The shop was small, in a building that was essentially the size of a common garage. No one knew the impact this small shop would have on racing throughout the entire Midwest. During the 1960's and 1970's, Donnie made a name for himself and Brown Automotive. This was due in part to his exceptional work on the engines he built, and also to the success he had in Drag Racing. In the early 1970's, Marc Brown had already made his way into the shop and took an immediate interest in the engines and cars he was constantly surrounded by. Young Marc had always loved tinkering with things. It was not uncommon for the family to come home to find clocks or household appliances strewn out in pieces across the floor, and Marc sitting there with a screwdriver. So it was no surprise that Marc quickly learned from his dad over the course of his childhood and teen years, during which he gained exceptional amounts of experience in the shop. In 1983 Brown Automotive moved to Salina, KS at our current location. Marc spent years driving a dirt Late Model from age 16 on into his late 20’s. This taught him to approach things from a drive-ability standpoint. Camshaft and cylinder head combinations which matched a customer’s driving style became a specialty of Marc's that has been hard to beat. In the late 1980's, Marc took ownership of Brown Automotive as Donnie went on to pursue other things. In April of 1995, Marc incorporated as Advanced Engine & Machine, which has become a name known across the country. With a combined 40+ years of experience, Advanced Engine & Machine can and will deliver the absolute best in Machine Work, Stock/Race Engine Performance, Reliability, and Customer Service. We offer a variety of services and products to our customers, and if by chance we cannot provide what you are looking for, we will do our absolute best to send you in the right direction.